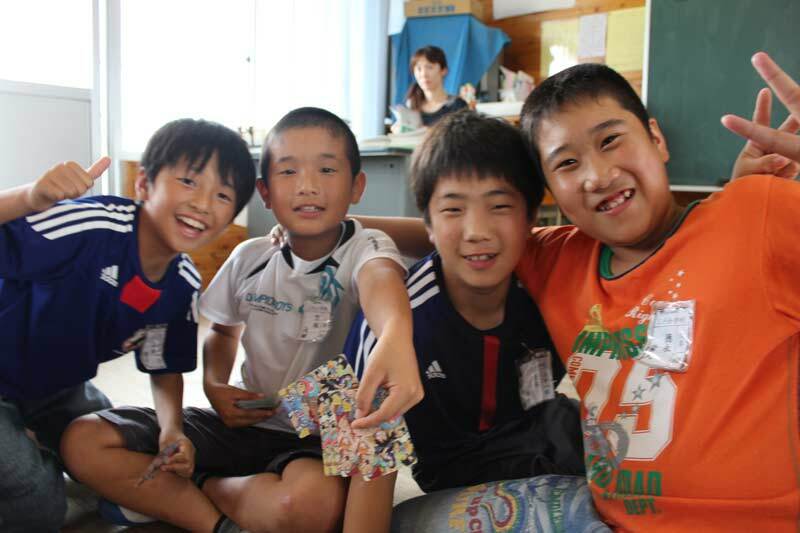 Today was the last activity day of the first session, and we spent it at Miike elementary school in Omuta. After introducing ourselves to the students during the morning assembly, we were assigned to spend the day with one class. I joined a 6th grade class together with Rod from Canada. At first the students were shy, but they quickly warmed up to us when they were allowed to ask us questions about anything (surprisingly many requested an imitation of Japanese comedians) followed by Rod’s Canada trivia. Afterwards we had music, during which we played Taiko – various kinds of Japanese drums. The loud drumming made it impossible for the students to tell us what and how to play. However, the children surrounded us and they taught us the rhythms by action rather than words. Also, they rotated helping us, and we got to interact with all the students in the class. Afterwards we had social studies. As the 6th graders were currently learning about the Muromachi era, the teacher had decided to get into the feeling of that time through Sado – the art of Tea ceremony. After eating lunch together, it was cleaning time. Because they finished the cleaning early, a group of boys asked if we wanted to play cards with them. Despite the fact that neither Rod nor I knew the rules, the kids, Rod and I had a lot of fun playing cards. And though we didn’t always understand each other, we all smiled and laughed together. The last lesson of the day was calligraphy. I was surprised by the suddenly serene atmosphere as we all sat quietly and drew Japanese signs on silky paper. In the end I was truly amazed by the contrasts I had witnessed that day: The shy class that welcomed us during the morning, the children vigorously hammering on the drums and the concentration and respect they displayed while practicing the old Japanese arts of Sado and of calligraphy.